China has placed mobile artillery weapons systems on a reclaimed island of the Spratlys archipelago in the disputed South China Sea, the US military claim amidst soaring tensions, a day after China accused the US of spreading “chaos” in the region. The United States has knowledge of two Chinese motorized artillery pieces on one of the artificial islands in the South China Sea, Pentagon spokesman Brent Colburn said on Friday. 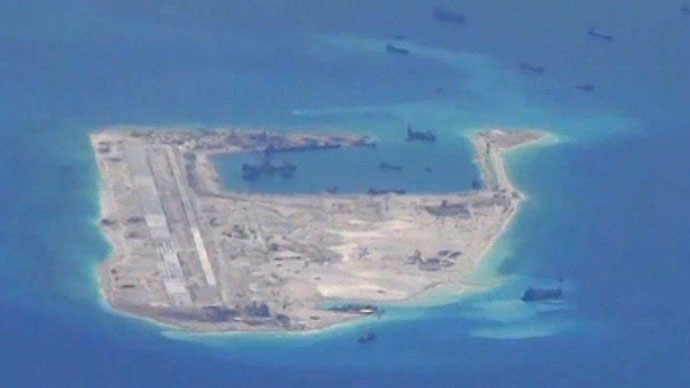 According to US officials, who have recently released surveillance plane footage depicting ships converting reefs into Chinese isle outposts, the dredging work has increased the territories of Spartlys by 1,500 acres this year. The archipelago is constituted by over 750 reefs, atolls and islands that present significant economic and political value in the South China Sea region, a major shipping route for international trade. McCain, who is a chairman of the Senate's Armed Services Committee, said at a news conference in Ho Chi Minh City that the latest development was both “disturbing and escalatory”, as cited by Reuters. He added that the Chinese actions were violating the international law and supposed that they would be “condemned by everyone in the world”. “We are not going to have a conflict with China but we can take certain measures which will be a disincentive to China to continue these kinds of activities,” McCain said. China's foreign ministry spokeswoman Hua Chunying said that she had no information on the weapons. Beijing says the islands in question are sovereign Chinese territory, it has the right to protect. China’s foreign ministry spokeswoman Hua Chunying urged Washington on Thursday to "refrain from all the provocative words and deeds"
"A few countries keep stirring up troubles in the South China Sea for (their) own selfish gains and provoking China's territorial sovereignty and maritime rights and interests, while there are some other people who incite them to do so," she said as cited by AFP. “If the major powerhouse of world economic growth is thrown into chaos, will that serve the interests of the American side?” she asked. The Philippines, Vietnam, Malaysia, Brunei and Taiwan also claim parts of the South China Sea. All these countries except Brunei have military fortifications in the major archipelago of Spratlys, which is supposed to have significant reserves of oil and natural gas. Meanwhile, Washington is also building up its military presence in the Asia-Pacific Region. According to the former US navy fleet commander Harry Harris, who gave a speech at the Australian Strategic Policy Institute this March, the United States is preparing to shift 60 percent of its fleet to the Pacific by year 2020. This March, the US accused China of “unprecedented land reclamation,” thus stating that China is “creating a great wall of sand” over four square kilometers – also in the Spratlys. “By hyping up 'China's military threat and the lack of transparency in military strength,' the report questions China's normal defense building and strategic intention, and makes inappropriate remarks on China's justified actions of safeguarding territorial sovereignty and security interests in the South China Sea,” the statement from Hua Chunying, China's Foreign Ministry spokesperson, reads.